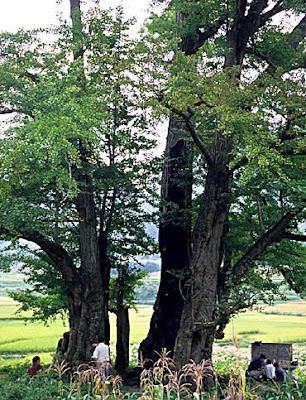 China: In Li Jiawan, Guizhou province, grows the Grand Ginkgo King, c. 100 km west of Guiyang. It is the biggest Ginkgo tree in the world in trunk diameter (Guinness Book of World Records 1998), 30 m, girth breast height 15.6 m, canopy c. 1,200 m2. This male Ginkgo tree is c. 4,000-4,500 years old. Xiang, Z., Y. Xiang, B. Xiang and P. Del Tredici, P. 2009. The Li Jiawan grand Ginkgo king. This tree is really 4,000+ years old? Amazing!